In our unofficial FAQ, we answer your questions on Sky TV, Sky+ and Sky+HD. Sky Digital is the UK’s satellite TV provider. To get Sky, you’ll need to have a satellite dish and a special Sky digibox installed at your home, and to subscribe to your chosen Sky packages. Installation of Sky TV requires an engineer to visit. For full details of the various Sky packages on offer, go to www.sky.com/shop. (Also Sky Ireland). Ordering Sky online saves time and money. Go to www.sky.com, choose your package and select an installation date (including weekends). The basic Sky service is available for £21.50 a month for the Sky Entertainment pack. A free Sky+ set-top box and standard setup is available when you order online. are not able to have a dish or to get a signal, as you need to have a dish pointing at a certain position in the sky. Some properties aren’t allowed to have a dish, some look straight into concrete, some are flats with no opportunity to fix a dish to a south-facing wall, and some properties have hills, mountains or dense trees obscuring line-of-sight to the satellite. Normal procedure is to arrange installation with Sky (via www.sky.com/shop) – if the installer can’t get you a signal, they won’t let you subscribe to Sky. Entertainment Extra Pack: All of the ‘Entertainment’ channels, plus channels such as Discovery, National Geographic, History, Yesterday, MTV, Viva, Bliss, Kerrang!, Q, VH1, Cartoon Network, Boomerang, Disney, Trouble, Fox News, CNBC, ESPN Classic and British Eurosport. You can also add optional “premium packs” (such as Sky Movies or Sky Sports channels). You’ll also get a number of free-to-view channels as well. Sky Digital doesn’t allow you to pick individual channels to subscribe (or not subscribe) to – you select from the preset Entertainment packages. To view these options and to see how much your monthly subscription is likely to be, go to sky.com/shop/tv. If you have any questions about packages that are not answered on this page, call Sky on 08705 800 874, or ask in our Sky forum. Sports fans may also be interested in subscribing to ESPN to get Premier League football, plus a range of European and US sports. More at our ESPN section. Note that Sky often runs offers and discounts, so before you sign up, check our Sky TV Offers section for a summary of the latest special offers. If you’re not happy with the packages, channels or prices offered by Sky – remember that there are alternatives – See our Digital TV Advice page for more. Note that one Sky dish can’t have more than eight ‘feeds’ running from it (and for that you need an Octo LNB on the dish, which are not supplied as standard). That means one dish can’t support more than four Sky+ boxes, or eight standard Sky boxes. More on LNBs. Where is the satellite? Sky Digital broadcasts from a group of satellites positioned at 28.2ºE and 28.5ºE above the Equator. Need help finding the satellite? See our Installing a Sky Dish FAQ. Outside the UK Sky Digital’s terms and conditions state that you can only watch Sky subscription channels if you’re living in the UK (including the Isle of Man and Channel Islands) or the Republic of Ireland. Sky will not accept subscriptions (for their channels, Sky+ and HD services) from outside of these areas – you need a UK postal address. The main reason that Sky does not sell subscriptions to non-UK residents, is content usage… For example, the BBC is free for UK licence payers, and there are restrictions on their shows being shown outside of the UK. Similarly, if Sky buys a hit show from the US to be shown in the UK, that’s for UK only – overseas broadcasters make their own arrangements. Content and copyright management is a nightmare for broadcasters, and that’s why it’s so hard getting UK TV outside the UK. That having been said, a signal from the satellites that distribute Sky Digital can be accessed outside of the UK. Sky Digital is transmitted on SES Astra satellites located at 28.2°E and Eutelsat’s Eurobird 1 satellite located at 28.5°E – these have “footprints” that cover parts of Europe, so the free-to-view channels can be accessed in parts of Europe (with a suitably-sized dish). Pictured on the right is the footprint of the Astra 2D satellite, which provides the BBC Free-to-view channels. You can find coverage maps for the Astra satellite on the Astra or Satcure sites. We have a page of information on what satellite channels are available without a Sky subscription – see our Free Satellite TV page. British TV outside the UK: Looking to get British telly and not in the UK or Ireland, see our Watching UK TV Abroad page. The Radio&Telly site is intended for UK residents, and we don’t provide any information on how to access Sky Digital outside the UK and Ireland. If you’re interested in accessing Sky outside of the UK and Ireland, perhaps try asking in our Sky forum. Worth considering: If you have a friend in the UK, you may be able to access UK TV over the Internet, using the Slingbox solution. Sky Broadband Sky Digital is now offering free Broadband to its digital TV customers. With Sky Broadband, you get a free wireless router, and at some exchanges, you can get speeds of up to 14 Mbps, with no download limits (on the Broadband Unlimited plan). Indoor Sky dish Now and again, we’re asked whether it’s possible to get Sky Digital via an indoor dish, or a dish in the loft. These questions normally come from people that are not allowed to install a dish on the outside of their property. Dish camouflage: If you’re not allowed to have a dish attached to your property, there are some other options – these include disguising the dish, attaching to a balcony, or attaching to a pole in the garden. You may find this site of interest. If you’re not able to get a dish installed where you live, you could consider other options such as Freeview, Cable or TV-over-Internet. See our Digital TV Options page for more. What happened to the Sky channel Bravo? The channel closed down on the 1st of January 2011 – What happened to Bravo TV? Aerial cable: If you have one Sky box, you can connect it to other TV sets in the house by running a co-ax aerial cable from one of the RF output aerial sockets on the back of your Sky box. Once connected, you need to tune the TV set into the output of your Sky box.If connecting via aerial cable, consider a Sky TV Link/Eye – This connects to your aerial cable at the ‘remote’ end. You’ll still only be able to watch the same channel on both TVs at the same time, but you’ll be able to use your Sky remote to change channels from another room. Wireless connection: If you’d rather not run cables, consider a wireless video sender – these connect to a spare SCART socket on your Sky set-top box. Again, these can only transmit whatever channel your Sky box is tuned in to. Connection to phone line Even though Sky programmes get delivered via satellite, I understand I have to connect my box to a phone line. Why is this, and what happens if I don’t? What about if you don’t have a phone line close to your set-top box? The common solution is to run a telephone extension cable from your home’s Master phone socket – kits are available from Argos and Maplin Electronics. No phone line? Apparently you can still get Sky installed without a phone line, but you’ll have to pay extra, and you can’t order online – you’ll have to call 08442 411495.
long enough. Can we buy an extension? Yes you can – you’ll need an “F Plug to F Socket” lead, available from maplin.co.uk . These have a female socket suitable for connecting to your existing lead from the satellite dish, with a male socket at the other end, which connects to the input of your satellite box. The satellite TV cable extension leads are available in 1.5 metre and 5 metre lengths. Change the RF channel number to a number of your choosing (between 21 and 68). It’s important not to clash with a TV service on the same number, and if after you’ve finished, one of your TV channels goes fuzzy, you have a clash and need to change the RF channel number again. To check your version number, use the Services button, System Setup menu, option 5, ‘System Details’. Please visit our Sky forum to discuss version numbers and updates. In order to ensure a free flow of air around your Sky+ box, allow at least 10 cm of space above and on all sides (especially between your Sky+ box and your TV). Do not cover any ventilation slots. Remote controls Problem with your remote? Make sure you’ve put the batteries in correctly, round the right way, and that they’re making contact correctly. Also, make sure the batteries aren’t flat. When you press the buttons, there should be a little red light at the top of the unit that indicates it’s working. Help on remote controls. Other problems: If your remote is working, but isn’t controlling the Sky box, you may have pressed the TV button, so press Sky and try again. The only thing that can wrong with a remote control, is if it’s left without batteries for more than ten minutes – if this happens, it may lose it’s ability to control the TV. It should still be fine with Sky / Sky+ though. Controlling your TV: To get the remote to work with your TV, you need to tell your Sky remote control which TV you want it to work with. This involves entering a four digit number for the make/model of TV into your Sky remote. The codes relate to different TV manufacturers. Refer to your Sky / Sky+ manual for a list of these codes and step-by-step instructions. You can also find a list of remote control codes via your Sky box – Go to Interactive > Sky Customer Service > Technical assistance. Replacement: Spare remote controls for Sky and Sky+ are available from Partmaster. You could also consider a universal controller, that can handle multiple remote control devices. Our favourite is the Kameleon, a stylish multi-device controller that can learn commands from an existing handset, or use one of a number of special codes for situations where you don’t have the original. Also, take a look at the range from Argos or Maplin Electronics. Recording from Sky Need help recording Sky programmes? Check out our Recording Satellite TV page. Watch Sky on a PC? Want to watch or record Sky programmes on your PC? See our Satellite TV on your PC page. Regions For the particular part of the UK in which you live, BBC and ITV stations broadcast a selection of regional programmes (such as local news). With Sky TV, all of the UK regions are transmitted via their satellites, and the postcode of your Sky Card decides which region you receive. All of the BBC regions are tucked away at the top end of the EPG, including BBC Scotland, BBC Northern Ireland and BBC Wales. S4C Digidol is available on channel 151, and the regional BBC stations such as BBC Radio Wales & BBC Radio Scotland also feature. 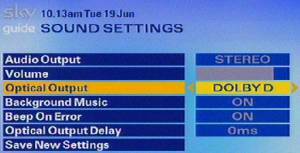 The ITV channels also appear, but they’re hidden from the EPG menu, and you have to add them manually. PIN protection Sky’s system makes use of a PIN code to control viewing of inappropriate content. To change or disable these parental control options, go to ‘Services’ > ‘Parental Control’, enter your four digit PIN code and select ‘Other restrictions’. Here you’ll have the option to enable/disable PIN prompts when trying to play back a programme before watershed (Sky+), to demand PIN entry before going online, PIN-protecting recorded programmes on Sky+, and to set spending restrictions. Wireless satellite radio Looking to be able to take Sky radio around the house with you? Sky’s answer is the Sky Gnome – This became available in October 2005, and is a wireless device that receives audio transmitted from the Sky digibox wirelessly. This lets you listen to the Sky Digital radio stations from around the house. The box has a range of about 30 metres, and allows remote channel switching of Sky and Sky+ boxes. Available in Blue and Orange, it runs from rechargeable batteries for up to 8 hours of remote playback of sound. These are sadly no longer available directly from Sky, but you can pick them up quite cheaply on Ebay.co.uk. Bad signal can be due to a number of factors – most notably something that breaks line-of-sight between your dish and the orbiting satellite – obstructions include trees, power cables, scaffolding and buildings. Also, bad weather, especially heavy rain, can affect your signal. Dish problem – any chance strong wind could have moved your dish? Take a look at the dish… any obvious damage or obstructions on the dish itself? Any cable damage? Could the dish be slightly out-of-alignment? You can watch a collection of Sky programmes on your PC using Sky Go. A number of the American shows found on Sky can be viewed online or downloaded from www.apple.com/itunes. Get yourself a Sky+ box, and use Series Link, to ensure you don’t miss out on future shows. Default Sky PIN Your Sky system will have a 4 digit PIN code that you should have been told when you signed up. It seems that in many cases, the default Sky PIN code is the last four digits of your Sky viewing card, which you’re encouraged to change. If you’ve had more than one card, the default PIN will be from your first Sky subscription card. but have just taped GAME OF THRONES but cant watch have to put in pin number for first time?? have a card supplied by you with a pin number on but will not accept it why?? All the FTA Indian Channels (AAjtak, News18 India, Geo Tez) etc..on Astra2 28 E have disappeared since last three days without transponder signal 13434 V . Please undertake needful so they can be received all over Europe. JP, BERLIN, GERMANY. I think focus is changed on UK but these channels are top quality news channels and we would like to receive it via satellite.